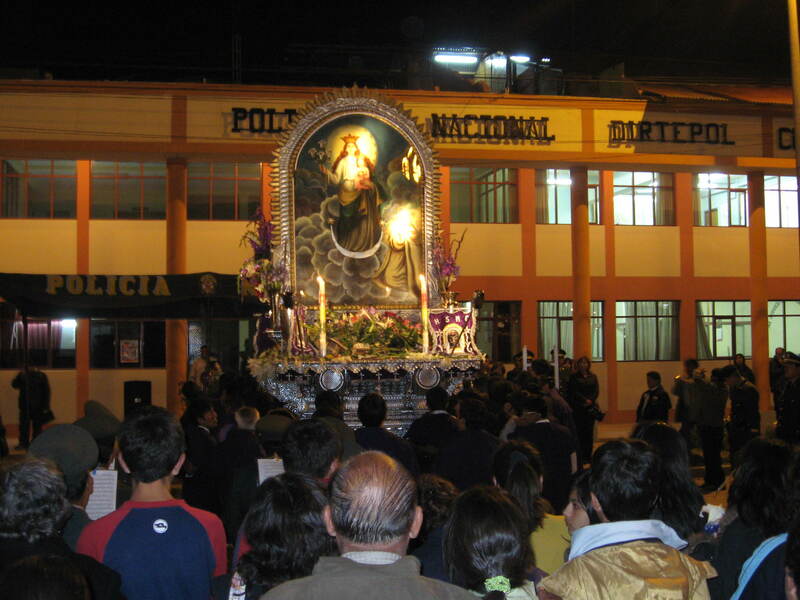 The annual procession of Señor de los Milagros was held on Oct. 12 in our neighborhood. Here in Peru, much of the month of October is devoted to Señor de los Milagros. 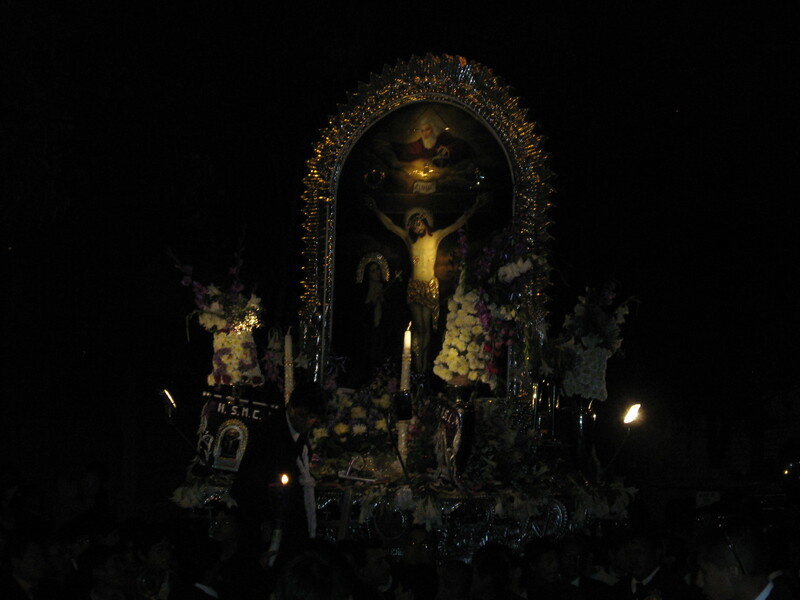 It is believed that Señor de los Milagros protects the Peruvian people from dangers and fears. I found some great info on the legend of Señor de los Milagros at kleph.com and also at americaninlima.com and Peru food. Here’s a picture of Señor de los Milagros passing through our neighborhood in Wanchaq and also in front of the Policia Nacional (PNP) at the plaza Tupac Amaru in Cusco. Separation of church and state is less stringent here in Peru than in the US. At the police station, there was a brief ceremony asking Señor de los Milagros to protect the police officers while on duty, as it is believed he accompanies the faithful and protects them from harm. This entry was tagged Cusco, Peru, religion, Señor de los Milagros. Bookmark the permalink. Thanks for sharing your photos and experience. I couldn’t make it out, but this gives me a sense of what I missed. October is an interestin’ month here in Cusco. Specially cuz of its traditions, like the procession of Señor de los Milagros. The story tells that the lord was painted in a wall at Lima n there was an earthquake, but the paintin’ was not damaged. nobaody could believe that, the entire church was destroyed but the paintin wasn’t. It fells good when a foreign like u is interested in our culture. Thanks 4 sharin’ ur experiences!! !